I can think of more than a few people who would go absolutely nuts over peanut butter and jelly. I suppose it goes way back to their childhood where they were treated with PB&J sandwiches for breakfast, lunch or tea time snack. Unfortunately, I wasn’t one of those kids who adore PB&J sandwiches. Even as an adult, I’m still remained unconvinced. My friends often throw me the “you-don’t-know-what-you’re-missing” look. Though I stand as a lone detractor amongst the PB&J lovers, I would proudly proclaim that I’m a Nutella girl through and through. My guilty pleasure is eating Nutella straight from its jar. 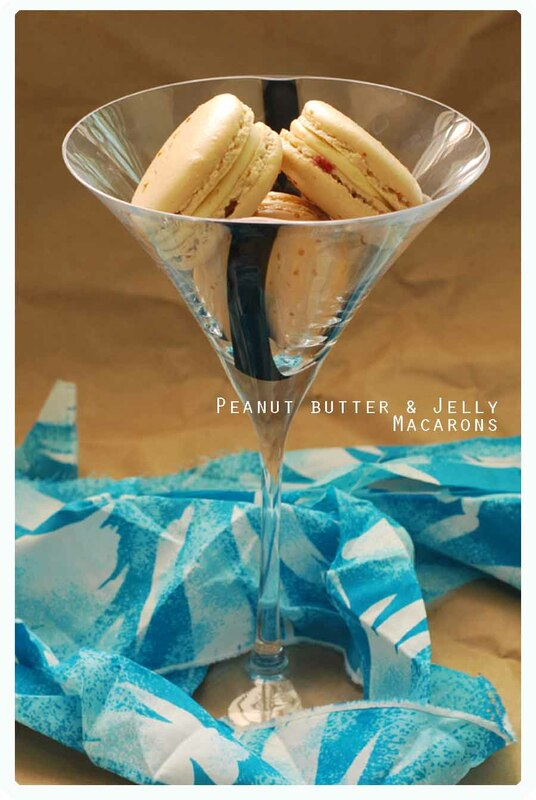 So it may be really bizarre that I am writing a blog post on making PB&J macarons. Equally strange is the dream I had that inspire me to make these macarons. I may have food-related dreams often but this is probably the only time where I had such a vivid dream of the entire process of baking something that I have not tried or thought of making. 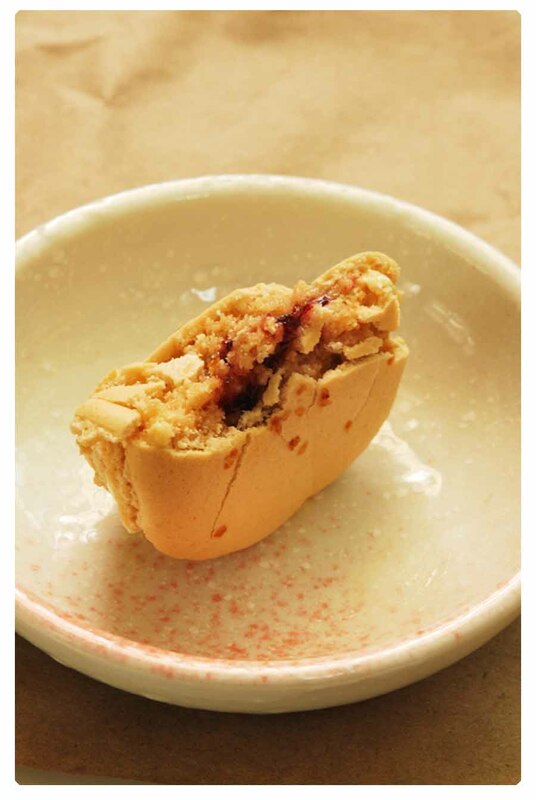 And in that dream, everyone loved the PB& J macaron, saying it’s the best flavour that they have eaten. I woke up from that dream vowing that I would give this a go and who knows, I may be the latest convert of PB&J. I spent an afternoon making these PB&J macarons without knowing what to expect. I’m sure you are curious to find out if I like the macarons. To be honest, I’m still not convinced. Give me a chocolate or lavender macaron any time. However, objectively speaking, the flavour of this macaron is very well-balanced. It is probably one of the least sweet macarons flavours, a little savoury even from the use of peanut butter and fleur de sel. By using my homemade apple and plum jam, it provided the macaron the right amounts of acidity and sweetness. This macaron is definitely for PB&J lovers. It’s hard to put it without sounding like I’m bragging – these babies receive more than positive feedback. It was just like my dream, almost. P.S I’m dedicating these macarons to all PB&J lovers out there! These aren’t your regular PB&J sandwiches but a reincarnation of your childhood favourite in a bite-size form. This time I use the French meringue method of making macarons instead of my usual Italian meringue method. If you are more comfortable using the Italian meringue method, do go ahead with it. Prepare your baking trays: Place baking parchment on trays. Process the almond meal in a food processor. Dry the ground almond meal in a 100 degrees celcius oven for approximately 15 minutes, or until it doesn’t clump together when pressed between two fingers. Sift together the (dried) ground almond meal and icing sugar. Make a french meringue: begin by whisking the egg whites in a clean, grease-free mixer bowl at low speed. Add in the cream of tar tar when the egg whites turn foamy. Increase the speed to medium-high and whisk until soft peaks before adding the caster sugar gradually. When all the sugar has been added, increase the speed to high and whisk until stiff and glossy peaks. You will know when it’s ready if you lift the whisk and the mixture is firm and doesn’t droop. Add in 1/4 of the meringue mixture as well as the wilton colour paste to your almond meal and icing sugar mixture. Fold them together. You do not have to be too careful about knocking the air out at this point. What you want is to lighten the mixture to a similar consistency as the meringue so it is easier to fold through the rest of the meringue. Add in the remaining 3/4 of the meringue and fold gently to incorporate. When it is well-combined, smear the mixture against the sides of the bowl with your spatula to achieve macaronage. This should be done about 10- 12 times to achieve a smooth, glossy mixture, without holding peaks. When you lift your spatula, the mixture should fall in about 5-6 seconds. The consistency should be similar to your choux pastry mixture. When it is done, fill the macaron mixture into a piping bag with plain nozzle size 8 or 10 and pipe the macaron shells onto a baking sheet. Try to pipe them as evenly as possible and leave about 1/2 inch gap in between the macarons. The mixture will spread a little. After piping the macaron shells, rap the tray against the kitchen counter a couple of times. This will help the pied (or foot) of the macarons to form. Let the macarons rest for about 30-45 minutes in an air-conditioned environment until they have form a skin and the batter does not stick to your fingers when you touch it. Bake in a preheated oven on the center rack at 165 degrees celcius for about 15 minutes and allow it to dry in the oven, with the oven door slightly ajar for 2-3 minutes. The macaron shells are ready when the bases are dry. You can try lifting one shell out to test, you should be able to do so easily. Allow the macaron shells to cool on its baking tray before attempting to peel them off the baking sheet. * 18/06/13 Note: I have changed the temperature of drying out the almond meal (from my last recipe) because I find that this increase in temperature dries it out more especially useful in a humid climate. I have also allowed them to dry out longer. You can use a spatula to toss them around to make sure they dry evenly and not burn. Just make sure that the almond meal doesn’t change in colour ie. go golden brown/dark brown. 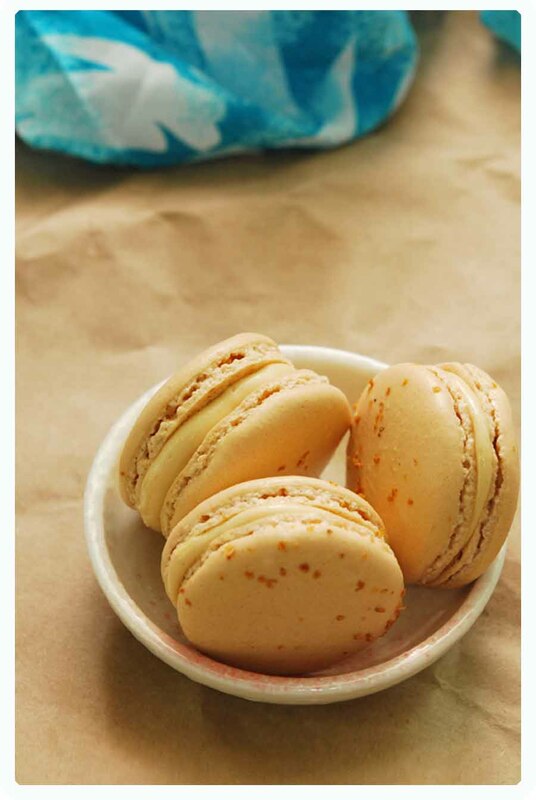 This would cause the almond meal to give out its own oil and the macarons would work in this situation. 1. Start by creaming the butter with a paddle attachment on medium speed for 3 minutes. Butter should start to look pale and light. Add in the peanut butter and cream for another minute. Add in half of the sifted icing sugar and cream on medium-high speed until combined. Then add the remaining icing sugar and cream for 5 minutes. 2. Add in the milk and fleur de sel. Beat on medium-high speed for another 5 minutes. The buttercream should be smooth, fluffy and of spreadable consistency. If it is too soft for piping, you can put the bowl of buttercream in the fridge for 10-15 minutes before using. I used my apple and plum jam but feel free to substitute with any store-bought variety like red current or raspberry. 1. Scoop out some jam and sieve it to remove huge pieces of fruit or seeds (if you are using raspberry jam). 2. Whisk the jam mixture to lighten and loosen it a little so that it will be easy to pipe. Pair up similar sized macaron shells together before you begin piping the filling. Fill a piping bag with the jam mixture and cut a small hole. Pipe a little jam onto the center of the bottom macaron shell. Using a plain nozzle size no 8 or 10, pipe the peanut butter buttercream filling around the jam center so it looks like a brown circumference around a red jam center. Place the second shell on top of it and twist it gently until the filling comes right to the edges of the macaron. Place it into the fridge to allow the macarons to mature at least 24 hours before consuming. This maturation process is important for the macaron shells to absorb the flavours and moisture from the filling giving it a nice chewy center. 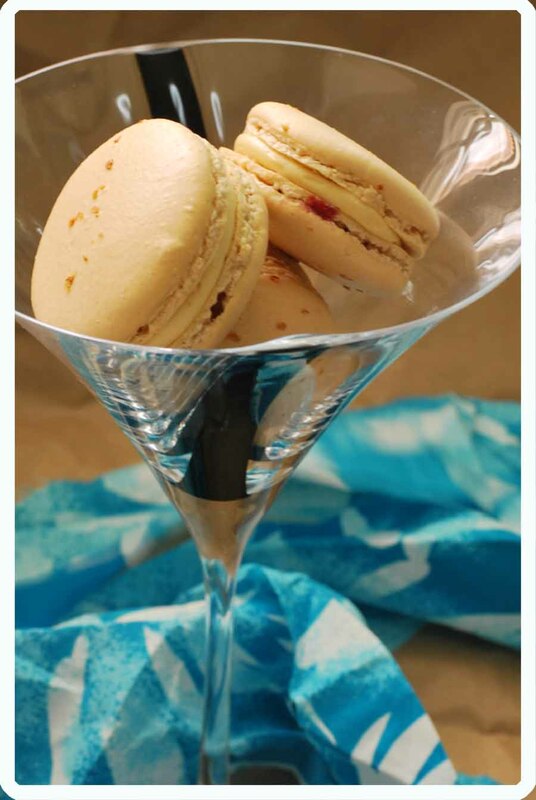 * Finish the matured macarons within 1-2 days otherwise the shell will be too soft. This entry was posted in Baking, Cookies, Macarons and tagged almond meal, buttercream, Egg whites, french meringue, Jam, macarons, pb&j, peanut butter. Bookmark the permalink. I didn’t grow up on PB + J sandwiches either, but I’ve grown to enjoy the combination. 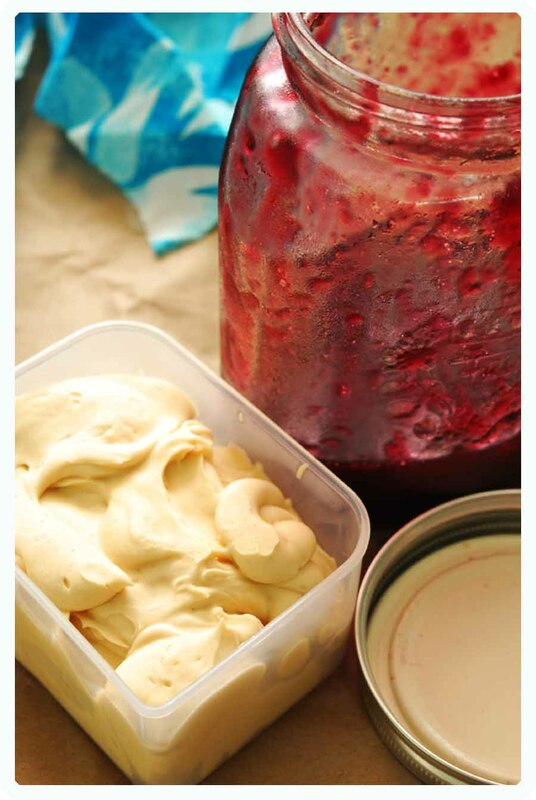 Something about the salty nut spread combined with sweet, gooey jam just works. I love your more grownup version in macaron form! ah yes.. glad that you have grown to like this combination. Somehow it is one of those crowd-pleasers.. I love your photographs. Simply beautiful! Your macarons look so perfect! I’m not a fan of these sweet little finicky things but I would love to make them for my friends who are mad over them! Peanut butter and jelly… yummy! What gorgeous macarons! They are so well done. Peanut butter and jelly sounds great. I am attending a macaron class today and hopefully I will do it as well as you! Oh macaron class! sounds fun! how did the macarons go! do share pictures! What an awesome idea!! So clever and these look delicious! Thanks for sharing the recipe! Thanks! hope you do try the recipe someday!